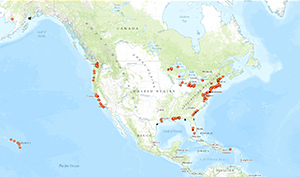 Since 2002, the Coastal and Estuarine Land Conservation Program (CELCP) has protected more than 100,000 acres through funds to state and local governments to purchase threatened coastal and estuarine lands or obtain conservation easements, with over 16,000 more acres protected as in-kind matching contributions. Lands selected to be protected through the program are ecologically important or possess other coastal conservation values, such as historic features, scenic views, or recreational opportunities. Many CELCP properties also protect critical habitat for species under NOAA’s jurisdiction under the Coral Reef Conservation Act, Endangered Species Act, and Magnuson-Stevens Fisheries Conservation Act. NOAA manages CELCP projects through voluntary partnerships with participating coastal states and territories. Participants have identified conservation priorities through conservation plans, which help inform competitive merit reviews. These reviews evaluate, rank, and ultimately determine which projects get national funding. NOAA has administered a competitive process each year that funding is available; there will not be a funding competition in fiscal year 2018. Use this map to find the location and more information about CELCP sites in each state.